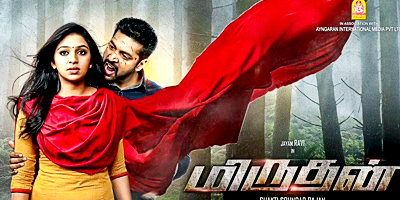 Miruthan is the first of zombie movie sorts in Kollywood with Jayam Ravi and Lakshmi menon in the lead cast, directed by Sakthi Soundar Rajan which also has Imman crooning the music. A simple number from the talented Vishal takes this song to a different level. Imman is breaking free from his stereotyped image of the folk king with songs like this that has different experimentation. The vocals is the biggest asset of this number which traverses between classic touch and breezy lyrics. Probably instrumentation that denotes the movie's theme, takes though with a ghostly touch adding bits and pieces of hollow violins. The majestic touch to piano takes the front seat as the song reaches climax. Overall the song is enough to speak volumes of Imman's capability. The song should do more justice with visuals for the energy that it infuses is impeccable. Rides high on the lead vocal singer Suraj Jagan, also making her presence is Maria who jumps seat with those ghostly eeire hums. With enough zombie musical elements, the number rocks back and forth. Two of the country's best melodious assets come together; Shreya Goshal and Vijay Yesudas clock their magic well in this number. A melodious number, it mixes rhythym, class and western touch in an edible manner. Karky's lyrics are at his creative best, brings emotions into the tune pretty much well. The tune is electrifying, as again should do justice with the visuals as it forms into a recursive BGM. That said the tune reminds us of various video game tunes, bits and pieces of Hollywood touches by all means. The beautiful song has Haricharan rendering his vocals for this mix of sounds and orchestration. The album is a mix of dark and haunting music which has enough mix of sax and strings. Imman brings a great deal of symphony with the right blend.